By participating in School Council, you can help your School Council discover new and exciting ways to contribute to the education of students in your school. Education is a partnership involving parents, students, teachers, principals, school boards, government, and the community. Your involvement in the School Council gives you the opportunity to strengthen that partnership, and to be part of a dedicated team working to support a high quality of education and an accountable education system for the children of Ontario. All Parents are Welcome! Please Join Us! Even if you just want to drop in and listen, we encourage you to stop by! We are currently seeking a community representative to join our council. Please contact us if you are interested in getting involved! We truly value parents' input and look forward to getting to know you! Feedback can also be provided through our Facebook site. Like us on Facebook to get the latest updates and to ask questions! 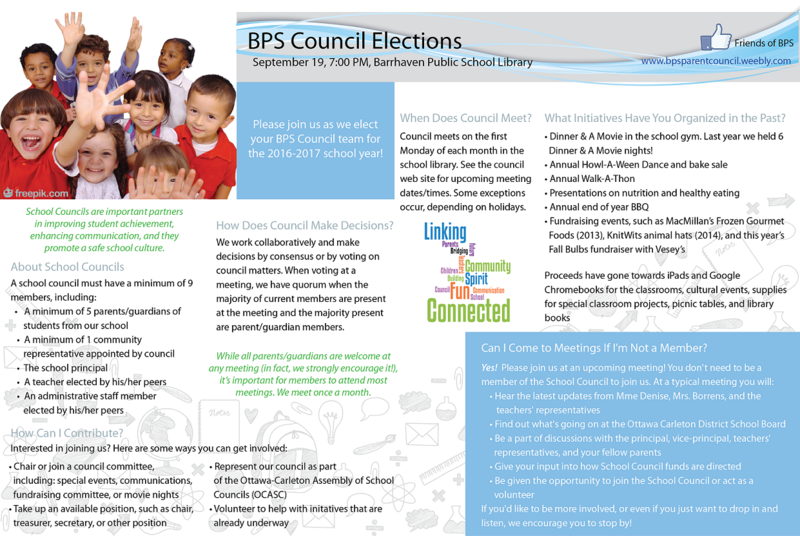 The BPS Council meets on the first Monday of most months throughout the school year. Elections for the executive volunteer positions are held at the beginning of each school year. Order with Mabel's Labels and 20% of your purchase will go directly to Barrhaven Public School. Click here for more information.